... when even your barest rough drafts seem like they'd be interesting to explore. Very exciting to see a large shot from so close! I hope detailing the environment treats you well. I’m curious, how many puzzles can be seen in this part? (parts and pieces of different ones) I count sixteen panels but I am wondering if there are more subtle ones there (if it would spoil anything please don’t answer me). Thanks! Looks interesting as hell! One thing I’ve noticed throughout most of the recent screenshots is that the trees are of varying colours. That is, some are the usual green while others are orange and yellow, which I think is pretty cool. Do you have a specific or rough number of puzzles in mind? 528 looks like a lot, and unless most of them are fairly trivial then you must spend a good amount of time thinking them up. Visually, what kind of end aesthetic are you aiming for? Is this it, the one in the banner or will you work towards being photorealistic? Variant Beauty!! That is what this screenshot shows. The bushes, rocks, water, trees, sand everything looks great. :) 528 puzzles…. going to keep the user delved into the game. Interesting. I agree it looks inriguing and inviting for exporation. How much of what can we see on this screenshot is a plqceholder graphic, and how much the target one? Does this puzzle count include the cloned puzzles you mendioned in the lat entry? Most things in that screenshot are placeholder. The stuff in the background (colorful trees and tower) are closer to final than the rocks and structures in the foreground, which are extremely rough. We are not at all aiming for a realistic visual style. That puzzle count should be correctly ignoring duplicated/temporary puzzles. So the 528 number is pretty close to accurate. It will be done when it’s done! But we are getting closer to done all the time. Have you guys been playtesting a lot or do you plan on playtesting a lot? I remember you said somewhere that you didn’t really playtest Braid all that much. I don’t have any game design experience at all, and I’m sure I might be incorrect; but from the games I’ve played, I need a lot more guidance in 3D puzzle games than I ever do in 2D ones. But maybe that’s just a pointless question. These picture look great and I love that updates are becoming more frequent – I check back here every day. Can you tell us anything about collision detection? It must be a real challenge to keep players from getting stuck on scenery. We do some simplified stuff for collision detection. We do still seemingly have problems with the player getting stuck sometimes, but there are mostly-straightforward ways around that, that we plan to implement in the future. The front page of this website– do you know what translation of the Diamond Sutra the quote is from? I’ve had a hard time finding it. It didn’t even occur to me that you would ever come up against such a problem. Is that common, for game developers to patent their code? How would you know when you’ve violated a patent? and how would they know you have once your game is released? That is really sad that the world has come to this. As a PC gamer, I would really like some flexibility. For a 2D game like Braid it was OK to have a console port. But for The Witness it wouldn’t cut it. Sorry If this was mentioned before, couldn’t go through all the other posts. We will try to do as much as we can to provide flexibility, given the amount of development power we have. However, you have the wrong notion about Braid. The PC version was not a console port. I developed Braid on the PC, and the xbox version was the port. But it tries to run at a fixed resolution because that is the resolution we processed the graphics for. By increasing the resolution all you would get would be blurrier bitmaps! Wouldn’t work. Jonathan Blow does everything in quaternions. These screenshots appear to be quite promising. Looking forward to further developments on the blog and the over all game. Do you folks have an estimated time-frame for release? Late 2013? I’ve been wondering for a long time where to write something where Jon Blow would read it, and now that I’ve found the place, I’ve completely drawn a blank as to what to say! Oh well, I hate obnoxious fans; now I hopefully won’t be one. If I had one question though…. 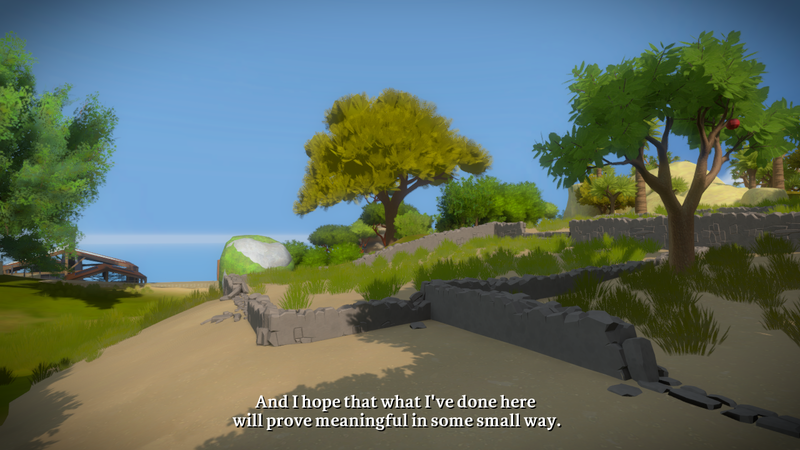 It might be ‘What will The Witness’ relation to Braid be? Will it deal with similar themes (with respect to the storyteller’s overall goals)?’ I’ve tried to omit my presumptions and speculations out of respect of Blow. 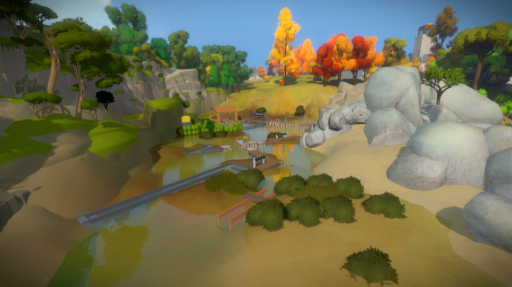 The Witness is a very different game from Braid, in terms of what you do from minute to minute; but at the same time you can see how it is an evolution of Braid philosophically. It is hard to say more than that without starting to spoil things. I’m certain that the example above is the traveling saleman problem. Any chance for other NP-hard puzzles?